We have a wholesale program available if you’re interested in carrying our cake pops in your café, coffee shop, or retail business. We would love to partner with you. Dipped in white, milk or dark chocolate and sprinkles. Made bon bon style (cake ball on bottom of stick) on 4 inch sticks and are individually wrapped. Dipped in 1 color of choice and Sprinkles in 1 color of your choice. Made bon bon style (cake ball on bottom of stick) or upright (cake ball on top of stick) on 6 inch sticks and are individually wrapped. 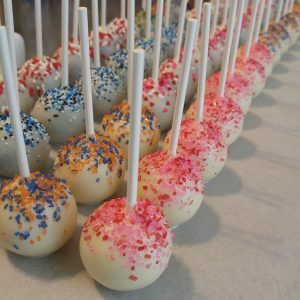 No customization on cake pops other than specified above to qualify for discount.